At our house the arrival of the new year's fly fishing catalogs is known as "research". As in, "I'll be a little late to work today because I am at home doing 'research' ". It seems I once received more than a dozen catalogs. But in recent years the number has declined to just a handful. Likely, the Internet has changed things for some companies as has the cost of publishing a catalog and the cost of postage. And I also simply don't buy as much fly fishing stuff anymore, especially now that photography has entered the scene as a serious hobby. 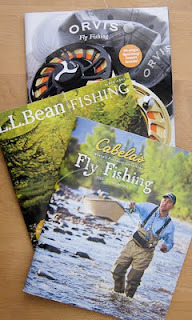 This year, like clockwork, catalogs from Cabelas, LL Bean and Orvis arrived on the same day. I don't buy as much fly fishing stuff as I used to (how many vises do I need? I have four! ), but from these three vendors I at least buy a few clothing items or Christmas gifts each year... enough to keep me on their catalog lists I presume. Perhaps the most complete catalog is the one from Bob Marriott's, but I haven't received one for a couple of years. I think the last one I received was nearly an inch thick. It lists tons of products. But because it features very few product pictures, the catalog is best if you know what you want. On the other hand Bob's Web site has improved greatly so hunting for the products is fairly easy without a catalog. I like the fact that if you buy $100 worth of goods (easy to do with their inventory) you get free shipping. Not quite as good as the "old days" when the limit was $50, but still pretty good when compared with, for example, cabelas which is known for its high shipping rates.